Like the rest of the world I watched the 1976 Olympics and was obsessed with stoic little gymnast from Romania and the unprecedented perfect scores. 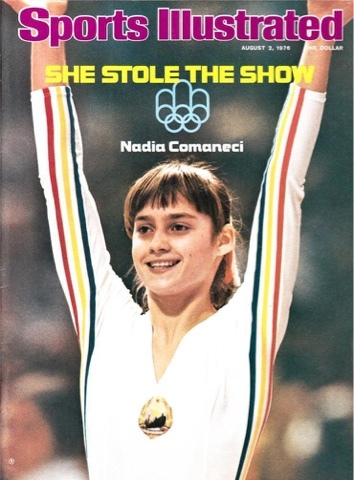 I was so in awe of Nadia, I hung up ice skates for awhile to pursue gymnastics. Not a unique endeavor as after the Montreal games, gyms were flooded with little Nadia want-to-bes. Of course, my always supportive parents not only had me enrolled in a local club but my Dad had me training in Quebec with an elite club. The good news was due to my years of figure skating, athletically I could keep up with the other gymnasts but the disciplines were all new and required me to be fearless. I competed in a few meets and pushed my limits of what I thought was possible, especially when it came to the balance beam and uneven bars. A couple years later I returned to figure skating but I have fond memories of this athletic detour. Happy Birthday Nadia! Thanks for the inspiration even if it didn't stick.